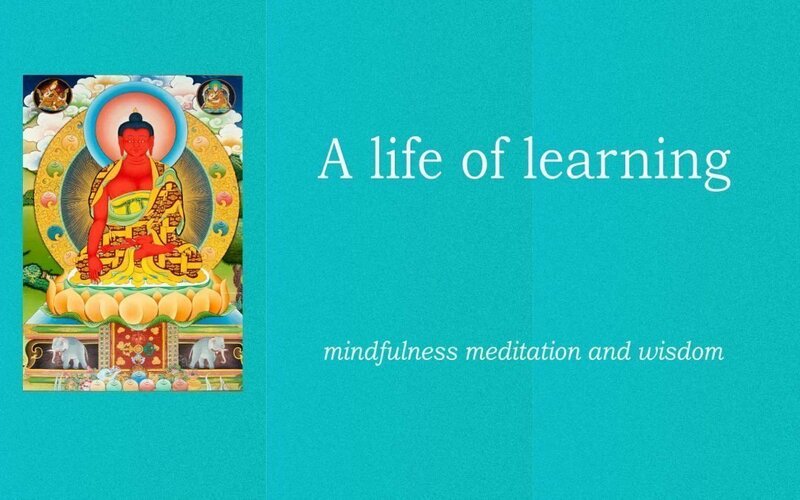 Learning mindfulness meditation establishes a platform for a life of continued learning and discovery. It is a very useful foundation for the development of wisdom and it is wisdom which puts an end to the suffering cycle of life, or samsara. The painful dimension of life is samsara. It is the outworking of our accumulation of past negative actions. That negative karma comes from non-virtue. All non-virtue arises from ignorance making it the root of the problem. Remove ignorance and we take out non-virtue, negative karma and suffering all at once. Way to go. Wisdom is our antidote to ignorance. The ability to see through ignorance with wisdom ends the pain cycle that is samsara. There are many aspects to wisdom, but one is the clarity it gives us in the ability to see through appearances. Ignorance is to believe things exist the way they appear. Anything which causes us to doubt those certainties breaks down ignorance. By investigating the nature of things we see through appearances. The spiritual practitioner is thus a subversive. He or she will not fall into line with accepted views. Rather, we question and challenge these views. It is tempting to go for the comfort and convenience of adopting the beliefs of others. We could profess a faith in these beliefs for the sake of acceptance. It’s easy to go with political correctness and let others form our views. But we find true wisdom in questioning, thinking and forming our own judgement. The process of challenging ideas and thinking things through leads to a genuine understanding. It is this which sees through ignorance. To take on beliefs with a mind of blind faith can only increase ignorance. It will thus only bind us more to samsara. The Buddha always taught in a way that encouraged those listening to think about what he was saying. He did not present a creed to hold and defend against the unbelievers. For this reason he taught at many levels. Some teachings seemed contradictory. His purpose was to present teachings which challenged us to develop wisdom. Wisdom arises from attentive listening, deep thinking, and strong meditation. Presenting contradictory views was his way of stimulating thinking. In time we see them as a skilful way of guiding us gradually from coarser to more subtle views. Any process which helps our wisdom will always improve our quality of life. The spiritual path is the path of developing wisdom. It is a path of continual learning. The great teachers have always encouraged robust discussion and debate. It gets us to a deeper level of understanding. Question and answer, whether processed by oneself or in a group, fosters wisdom. Once we begin down that path differing philosophies do not cause confusion. They present opportunities for deeper and more refined exploration. An opponent’s diametric view of something challenges us to determine which is the more useful. Finding which makes more sense deepens our wisdom. It can lead us through the mystery of paradox as is prominent in the Zen approach. All this is contrary to the non-thinking approach where two opposite views leave you tossing a coin. The outcome decides which tribe you join, support and defend. One is a process of learning while the other is lazy blind belief. Another important part of the spiritual journey is constant reminding. We may develop an insight while listening to a teaching or meditating. But back in the day to day of ‘nothing-but suffering’ we forget our insight. We need constant reminders. This makes a regular meditation practice so important. Another reminder is to hear the teachings again and again. It helps provide the constant reinforcement we all need. You can never hear enough teachings and never hear them often enough. It always helps. Meditation is to cultivate virtue. It is again a process of constant reminder. You acquaint yourself with virtue. Consistency becomes powerful. By learning mindfulness meditation we can be mindful through our daily activities. We can be mindful at work, with family and social obligations. It is another form of familiarity which fosters a life of learning. With mindfulness there are many ways to learn from everyone and everything around us. Events will challenge our patience and compassion. They will remind us to be generous. Some people and events will point out our faults by causing us pain. At other times they will give encouragement to our virtue by stimulating our joy. We will find opportunities to exercise our wisdom to solve problems. We can always enliven our love and compassion in the way we engage our relationships. Mindfulness helps us remember the teachings which apply best to our situation. We deal well with the here and now and bring our virtues to it. Learning mindfulness meditation allows us to see more. We come to know the subtle forms and energies which shape our existence. In meditation we can rise above the conflict and confusion of the day to day and take a panoramic and wise view of the world and see more clearly our place and purpose within it. With meditation we are always learning and find there is ever more to discover.